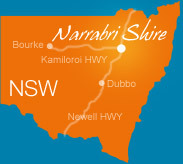 The following camping grounds are located in Narrabri Shire but are not managed by Narrabri Shire Council. For a listing of camping grounds visit the Narrabri Shire Visitor Information Centre or call (02) 6799 6760. They will provide you with details on these camping grounds, their locations and contact details to seek permission to camp in these locations.